Ordination homily: The priesthood is not a career in the usual sense; it's not be lived as a path to advancement in the Church. The Lord has chosen you for this service, not to make your own way. Our Lord spoke simply and reached hearts; don't give homilies that are too intellectual or elaborate. A priest who's studied theology and achieved advanced degrees but hasn't learned to carry the Cross is useless as a priest. Be merciful; don't saddle the faithful with burdens they can't carry, and don't burden yourselves. Jesus reproved the doctors of the law for this, calling them hypocrites. We've considered the Christian's call to “go out from ourselves” to hear the Lord, and the importance of the Church as the privileged place where God’s call is born, nourished, and expressed. Now I reflect on our calling's missionary dimension. Those who follow Jesus discover a desire to bring the Good News to others through proclamation and works of charity. Christians are called to be missionaries! We can't keep the joy of God’s transforming love to ourselves. We don't receive God’s love for our personal consolation or to promote ourselves. The gospel joy that enlivens us is a missionary joy. We hear God bidding them to “go about, doing good and healing.” Every Christian is a “Christopher,” a Christ-bearer, especially priests and consecrated people. Priests are called to go forth from the temple and to let God’s love overflow for the sake of humanity. The Church needs priests who have discovered the true treasure and are eager to go make it known to all. We can respond to questions about being a missionary of the gospel by meditating on three scenes: the inauguration of Jesus’ mission in the Nazareth synagogue, his journey in the company of the Emmaus disciples, and the parable of the sower. Jesus is anointed by the Spirit and sent. Missionary disciples share actively in Christ's mission: “The Spirit of the Lord is upon me; he has anointed me to bring good news to the poor, sent me to proclaim release to captives and recovery of sight to the blind, to free the oppressed, and to proclaim the Lord’s favor.” We're to be anointed by the Spirit and go proclaim the word and be a means of salvation, with Jesus at our side. Questions and challenges can make us feel bewildered, inadequate, and hopeless. Our mission might appear an illusion or beyond our reach, but if we contemplate the risen Jesus walking alongside the Emmaus disciples, we can be confident. In that scene we have a “liturgy of the street,” preceding that of the word and the breaking of the bread. Their hearts were broken, their hopes dashed, their dreams shattered; gospel joy had yielded to sadness. But Jesus didn't judge them; he walked with them and gradually transformed their discouragement. He made their hearts burn and opened their eyes by proclaiming the word and breaking bread. Similarly, we realize, even amid weariness and misunderstanding, that Jesus walks, speaks, breathes, and works with us; we sense him alive with us in the midst of the missionary enterprise. Jesus makes the seed grow. We must let the Gospel teach us how to proclaim. We can hunger for power, proselytism, or fanaticism, but the Gospel tells us to reject the idolatry of power, success, undue concern for structures, and the spirit of conquest. The tiny seed of the Kingdom silently grows, thanks to God’s activity. “The kingdom is as if a man scattered seed, and it sprouted and grew, he knows not how.” We're confident because God surpasses our expectations, surprises us with generosity, and makes our efforts bear fruit. Confident, we become open to the Spirit, the basis of mission. Contemplative prayer is essential to mission; Christian life needs to be nourished by listening to God’s word and cultivating a personal relationship with the Lord in Eucharistic adoration. I encourage this profound friendship with the Lord, to implore new vocations to the priesthood and consecrated life. God's People need to be guided by pastors serving the Gospel. Don't yield to discouragement; keep praying that the Lord send workers. May he give us priests who love the Gospel, living signs of God's love, close to their brothers and sisters. We can regain fervor in preaching and can encourage people become disciples. Though many consider faith as listless or a duty, people desire to discover the attraction of Jesus, be challenged by his words and actions, and cherish his ideal of fully human life happy to spend itself in love. Through Mary's intercession, may we be given her openness of heart, readiness to respond to the Lord’s call, and joy in setting out to proclaim Jesus to the world. Regina Cœli: Pray the Rosary for peace, especially this month, as the Virgin of Fatima asked us to. Msgr. Albert Bahhuth homily podcast: Be caring, loving shepherds like the Good Shepherd. Trust God to feed and help you. 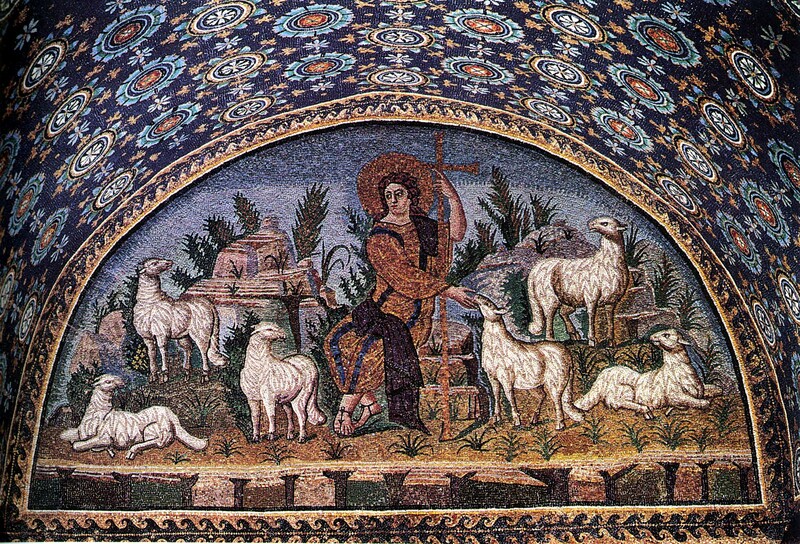 Creighton: Today we look at Jesus as the shepherd who cares for his sheep. It's hard to be a shepherd. Shepherds lay down their lives for their sheep, caring for them 24/7. They travel with them, seeking fields for their food; they lead and watch over them. At night they find a safe sleeping place. Even when they're enclosed, they need to attend to the sheep. Thieves can enter and steal sheep; shepherds need vigilance and sleep. As a sheep enters, the shepherd examines it for wounds. When all were inspected, he lies across the gate to sleep to keep sheep from straying outside. No one can come in without alerting the shepherd. Jesus identifies with both the shepherd and the gate. As shepherd, he watches over us, keeping us nourished and safe; as gate, he cares for us as we pass through. The Father sent him to embody God’s care for us. We should watch for and receive God’s love, goodness, and care. God is always on our side, here for us as the shepherd pours himself out for his sheep. As God’s beloved, we inherit the goodness we're offered; may we discover it and pass it to others who call out to us to share the mercy and forgiveness the Shepherd showed us. 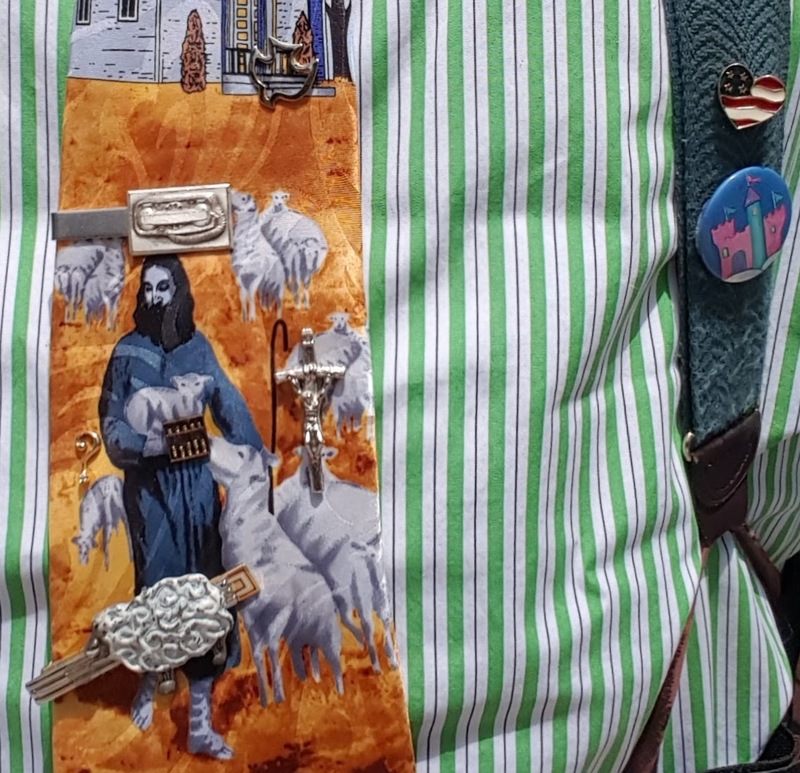 One Bread, One Body: "Walking through a minefield": We don't have the experience of pasturing sheep to help us understand the image of the Good Shepherd, but we know our need to be "shepherded." Shepherds guide the sheep. We're on a rough, narrow road to eternal life, traveling through territory occupied by a "corrupt generation," a "culture of death." As we walk through this "valley of... death," we suffer insults and persecution and are in danger of being slaughtered and destroyed, as if we're walking through a minefield, in danger of an explosion in our families, marriages, work, health.... We need guidance; we can't see mines below the surface. "I am the Good Shepherd, who lays down his life for the sheep." DailyScripture.net: "I came that they may have life abundantly": The Old Testament speaks of God as shepherd of his people: "The Lord is my shepherd." "Give ear, O Shepherd of Israel." "We are the sheep of his pasture." 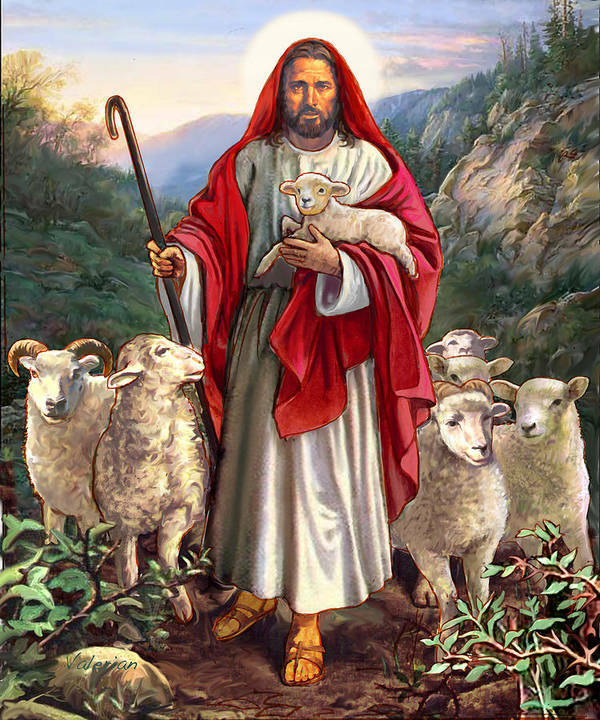 The Messiah is pictured as the shepherd of God's people: "He will feed his flock like a shepherd." Jesus is the Good Shepherd who will risk his life for the stray sheep; he is our Shepherd and Guardian. At day's end shepherds brought their sheep into shelter. Sheep know their shepherd's voice and come at his call. Each is called by name. In winter sheep were brought to a communal shelter a guardian kept secure; in summer they were kept in fields then gathered at night into a fold guarded by a shepherd, the door they had to pass through. God is a shepherd who brings his people security and peace. "The Lord will keep your going and your coming forever." Leaders are called shepherds: they'll lead them out and bring them in, that the Lord's people not be as sheep without a shepherd. As a shepherd watches and protects his sheep, so Jesus watches us as our Shepherd and Guardian. Jesus laid down his life for his sheep, that he might change his body and blood into food, and nourish the sheep he redeemed. He showed us the way. We must use our goods in mercy for his sheep's needs, even giving our life. (St. Augustine, Homilies on the Gospel of John, tractate 46, paraphrased). 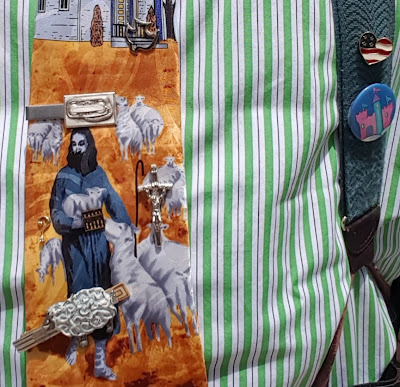 'Phone' tie bar: Respond to God's 'call'; pray for vocations.